Debenhams declined to comment on store closure plans. The department store chain announced in October that it was increasing its store closure plans from 10 to 50 shops - putting 4,000 jobs at risk - which would take place between three and five years. At the time Debenhams said it was not ready to release a list of those stores it was looking to shut. However, under a CVA, that closure programme would be accelerated and 20 shops could be shut in 2019. It is expected to update shareholders on its progress within the next few weeks. Last year, House of Fraser fell into administration before Mike Ashley, the billionaire Sports Direct founder, bought the department store's assets for £90m. 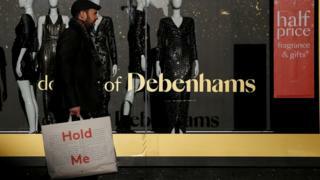 Mr Ashley is also a major shareholder in Debenhams, with a 29% stake, and he recently joined together with investor Landmark Group to vote the retailer's chairman and chief executive off the board.